If you are heading to France for your holidays please don’t forget that a lot of French swimming pools insist that male swimmers where speedo style swimming trunks. So if you have only packed your board shorts or longer trunks beware that you might be banned from the pool by the lifeguard. For us reserved English men, the wearing of speedos are often viewed with a sense of fear, after all there are very few people who carry the look off. But we can say from personal experience, check out the Happy Camper, that without a pair you can be prevented from swimming so it is always worth taking them with you. With a truly beautiful location, La Plage offers you the ideal place to get back to nature in a rural setting. It is also close to a sheltered and unspoiled beach. 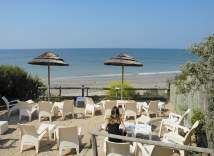 La Plage at La Trinite sur Mer is a most attractive parc, neatly divided by trees and hedges and set amidst the well-kept gardens of an old Breton farmhouse. Boasting a small friendly pool with waterslide, it’s also just a short walk from a shop, takeaway and bar/restaurant with lovely sea views. All sorts of activities are organised for children in high season and older ones can also join in the fun at occasional concerts in the bar. However, it’s the direct access to a sheltered sandy beach that brings so many families with young children back time after time. Beyond the parc, La Trinité-sur-Mer, originally a small fishing port, is now an important centre for the yachting fraternity and also has a popular market. Our 36th year at this parc. Why wait until the school holidays to enjoy a holiday in France when you can enjoy an early summer break? Parks are less crowded, the roads are quieter for travelling and the weather is just the right temperature – plus, your holiday costs less too. 7 nights, 15th May, 3 Bedroom Superior + Decking + AC…. WAS £360 NOW £295 per family. Don’t forget to check out all our listings for the Loire and Languedoc. We are delighted to say that Siblu is the latest holiday partner to join the Find Holidays in France directory. An established and highly successful holiday park operator in France, the addition of Siblu holidays further improves the choices available to the users of this site. Siblu offer high quality mobile home and caravan holidays in France. The parks are all of a high standard and, where offered, the entertainment on site is excellent. Terms apply. Book by 31/3/10. Subject to availability for more information, please contact Thomson Al Fresco. Eurocamp has launched a spring 10 day sale – with some superb savings on holidays between late March and early June. The sale is only available for 10 days, as it ends on the 15th March 2010, so hurry. Holiday parks are great for a family break this Easter, so why not have a look at a whole range of Parks in France. If you are after a short break and not wanting to travel as far as Provence and Cote D’Aur this Easter then Brittany and Normandy are ideal alternative locations. You will find Thomson Al Fresco at a number of these sites but also check out Eurocamp and Keycamp who also offer excellent quality mobile homes and camping accommodation. Welcome to the Find Holidays in France blog. Simply this is a blog about all things France. Special offers, discounts, travel news, reviews, places to go, things to do… you name it, we want to cover it. Feel free to add comments or send things you want to include. Find Holidays France Blog by Themebuilder | Entries (RSS) and Comments (RSS).